I've been taunting you with glimpses of the quilt made using Plume fabrics by Timeless Treasures. Now it's time for the big reveal! Originally I intended to back the quilt with a plain royal blue cotton. After I had it basted however, it was bothering me not to use the royal blue print from the Plume line, so I took it all out and started over. I am very glad I did. The feather theme was carried through into the quilting, which was done using a gold metallic thread. I stitched feathers up the "legs" of the central palm blocks. I echo quilted an eye in the gold NYB centres, and stitched feathery peacock plumes in the V shape below. Although it is rather heavily quilted, spaces were left to allow the loft of the wool batting to puff. I like how the piecing draws your eye to the centre, so to accentuate that I added a sparkly black button. This interestingly shaped quilt is neither round nor oval but has elongated patches added top and bottom; a beaded black tassel adds the finishing touch. Amazingly, I stumbled across a tassel which was a perfect match for the button. What are the odds? After the binding was added, I decided to block the quilt to ensure it would hang straight. To do this, I pinned the quilt to a cardboard cutting mat and sprayed it with water. Then I covered the quilt with plastic and left it overnight to dry. Here you see the reason for the plastic. Polly assumed guard duty. It took some time to come up with a good name. Jackie from dayle's suggested a crossword dictionary which was a terrific idea. I discovered that the name for a flock of peacocks is an ostentation, and it aptly describes this showy, ostentatious quilt of glitzy fabric and thread. Because I was so pleased with my finished design, on a whim I sent off a picture to Timeless Treasures who are running a "Stitch Star" contest on this fabric line. How exciting to get a phone call from their office in New York last week telling me Ostentation is a semi-finalist! The quilts are all shown on the Timeless Treasures Stitch Star blog and voting is now underway for People's Choice. The prizes in this competition are substantial - $5,000.00 and a Horizon Memory Craft 7700QCP Sewing Machine by Janome for first place - so I do hope you will take a moment to vote. Think of all the fabric that would buy...! Polly has not been very happy with how seldom we have been near the sewing machine recently. I am sure she figured we would never get that string quilt finished on time. But we did. We set this one together with a big star in the centre, an apt reflection of the recipient's persona. He's a star student, athlete, and friend to my youngest; he stands out in everything he does. I decided to quilt stars, and I printed out a ring of stars from EQ7 on cardstock. I cut around the design to make my template for tracing. I considered for a moment how to stitch this in a continuous line and decided the easiest way was to quilt the outside of the stars, and then the inside, joining my line of stitching in the process. It worked great. However...because the string patchwork is so busy, the stars did not show up well. I went for a bolder design in the centre of the star - a feathered wreath. It stood out a bit more prominently. The remainder was quilted in squiggly lines. I used a 12" square ruler to true up the corners when I trimmed off the backing. As it rained most of the week, I decided perhaps I should take some indoor pictures. Polly of course was on the job to help. I have a plastic sheet under the quilt so it doesn't get wet on the bench. The advantage of shooting on an overcast day is the even exposure so it all worked out fine. Even though these four childhood friends are all heading in different directions, they are now (literally) connected with common threads. Making a quilt with meaning is a wonderful experience for both the maker and the recipient. It's really what quilting is all about. Kate Seely from Ontario is working diligently on her New York Roundabout mat. Isn't it gorgeous? She took a break from it this winter to do this Oriental. Of this mat Kate writes, The Oriental is called "Double Happiness" because that is what the grouping of 2 characters at each end of the rug mean. I was at loose ends deciding what to do in the purple columns because I had hooked in a number of things and taken them out because I didn't like them. Knowing how complex Chinese characters are, I decided to see if numbers were any easier. They are! The characters down the left side and up the right side read 6 1 2 4 9 - my birth date. Thanks to my friend Sheila for sending along this post from our provincial newspaper, the Halifax Chronicle Herald. Worth a read! Readers of this blog will recall I made a quilt using Plume fabrics from Timeless Treasures. I spotted the fabrics in Halifax one day and fell in love. I had no design in mind when I purchased them but once I sketched the quilt out on the computer I realized I needed another colour. When I Googled to find the fabric, I discovered that there was a contest connected with this collection. I didn't pay much attention at the time as I was not interested in a competition - I was making this quilt for me. However, when I got it finished I liked it so much that I filled out the application form and sent off the required 8x10 prints to Timeless Treasures. I did not give it another thought; the quilt has been hanging in my livingroom for the past few weeks while I cleared a spot in my work room for it to hang. Imagine my shock when I answered the phone at suppertime last evening to hear Hayden from Timeless Treasures telling me that the quilt has been selected as one of 15 finalists!!! It was truly an OMG moment, as they had tons of entries from all around the world. Since I didn't pay much attention (ok, any attention...) to the contest rules, I am unsure as to whether I can show the quilt at this time. I think there was mention of a travelling exhibit, but I don't recall if that is just for the 3 winning quilts or all the semi-finalists. All I know is that I need to find a box to mail it off to Broadway in New York, New York (even that sounds cool!) Oh, and the name I chose for this piece is "Ostentation". Not only is that a great name for such a showy quilt, it's also the name for a group of peacocks. Wish me luck! Sadly...not me, but a piece of me has been shipped off in that direction. Earlier I mentioned that Log Canada has been selected to be part of the European Carrefour de Patchwork show being held this September in Ste. Marie Aux Mines in Alsace, France. Quilts were chosen from each of our 10 provinces and three territories to represent quilting in Canada. Log Canada, which appears in the book Canadian Heritage Quilting, has already toured the U.S. as part of the "Oh Canada" exhibit with International Quilt Festival, made an appearance at Quilt Canada in Calgary, and even had an impromptu stop with a showing in Ottawa. It is well travelled as a quilt ambassador. Curator Sandra Reford is working hard to make this a memorable exhibit in France and she asked each artist to send pictures of their home which she would assemble into an album to display at the show. Beyond the thrill and honour to be part of all this comes a certain responsibility - not to be taken lightly -in showcasing your home to the world. I pondered for some time what I would send, and which telescopic aspect of "home" I would zoom in on: Canada, Nova Scotia, Cumberland County, Amherst...or my backyard. Would it be something I see from my window, or a shot of our beautiful downtown street scape? How about blueberries from Cumberland County? As much as I wanted to show all of these things, it was also a tug at the heartstrings not to include a shot of where I grew up in Five Islands (without parallel the most beautiful spot on this earth). What would you send? I showed Five Islands, a small community situated on the Minas Basin at the head of the Bay of Fundy. I spoke about how it boasts the highest tides in the world; twice daily the bay fills and empties of a billion tonnes of water, going from nothing to over an incredible 16 meters. I sent pictures of Amherst, the shire town of Cumberland County which is famous for maple syrup and wild blueberries, and made mention of its proximity to the New Brunswick border, the fact it was founded in 1764, and about the many beautiful Victorian homes found in our community. For good measure, I tossed in that Four of Canada’s founding fathers (Fathers of Confederation) came from Amherst, Nova Scotia. In addition to the usual straight on and detail shots required of the quilt, I sent some "glam" poses as well, as these quilts will be featured in several magazines as well as possibly a show catalogue. Sandra liked this one taken on the snow in my backyard; she thought it looked "very Canadian". 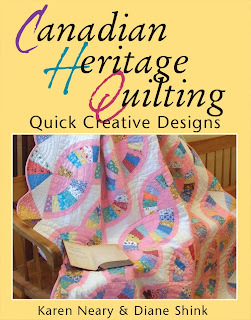 Articles on the exhibit are lined up for Studio Magazine, The Canadian Quilter, A Needle Pulling Thread, and fibreQUARTERLY. 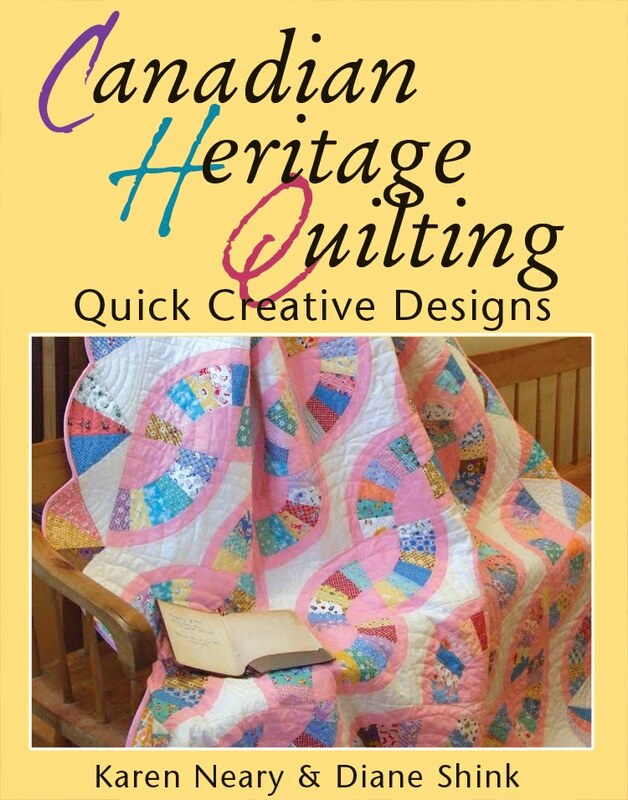 As Sandra is giving a lecture on the history of quilting in Canada, I sent along a copy of Canadian Heritage Quilting. The pictures and write up were well-received on her end and I am pleased I made the effort to include all I did. All work and no play makes Karen a dull blogger ...but some things in life just can't wait. Mother Nature is one of those things. The blueberry blossoms are winding down and the plants are beginning to set fruit. The bees have done a stellar job with their pollination chore and the colonies have increased exponentially from the goodness they extracted from those blossoms. 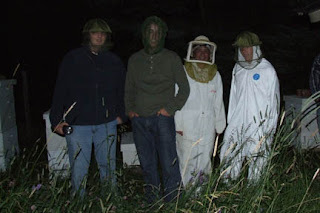 The hives are filled with bees. It`s time to add honey supers (boxes) to the top of their colonies so they can begin storing their sweet food. Before the honey boxes go on, a queen excluder is added to the top of the hive. It is a metal (or plastic) mesh with openings through which the worker bees can squeeze but are too small for the large-bodied queen. This prevents the queen from laying eggs in the honey frames; she stays down below and raises brood in the main part of the hive. These are metal excluders; the dribble down the front is just a bit of wax left from last season. The bees will be on the move again very shortly, as the cranberry blossoms are almost ready. Just when the variety of reds in my stash has dwindled to a thread, I answer the doorbell to find a surprise packet of reds and blues. Some were already cut into strips - how perfect! What fun it is to go through fabrics from another's stash. My blocks were quickly finished, and I began removing the paper. It wasn't such a task really since the television provided lots of entertainment. I watched Paul McCartney sing for Her Majesty Queen Elizabeth ll's Diamond Jubilee celebration, as well as the transit of Venus across the face of the sun. To cut down on mess, I put the blocks inside a recycling bag to remove the paper. Now I will stitch around the perimeter of each of the blocks to ensure that my seams are secure. Thank you, Lesley; your timely infusion of fabric has allowed my project to stay on track. The sisterhood of quilters is truly amazing. Don't tell Polly...but I am at the half-way mark on the string blocks. I managed to get a picture while she napped.